I had a great time making these and we had a good time eating them :-) A treat is a wonderful thing every now and then and a summer treat is even better! I've been looking around recently and there seems to be some really great value holidays to Benidorm out there. Having a trip to sunny Spain along with this summer treat above is my idea of paradise! Here's to holidays, food, and fun! Five years ago today, Brit Boy and I were engaged to be married. We were visiting Stourhead which is a beautiful estate in southwest Wiltshire. I had no idea that this would be the day that he would propose to me. I was over here for a visit and I just thought it was a nice day out. We walked around the main house on the estate and then we set out for a walk around all the trails through the beautiful gardens. There are several other buildings on the site that peek out of the trees. It's gorgeous there. It was a beautiful day and a wonderful experience. Stourhead holds a special place in my heart. So this morning, Brit Boy went out early to do an errand and I didn't go with him since I needed to study. 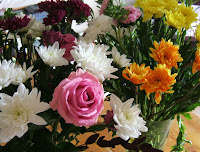 Well, he comes back into the house with a big bunch of flowers for me to commemorate this wonderful day in our lives. What a wonderful day this will always be! 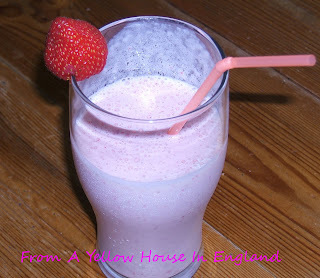 This is one of our favorite things around the Yellow House these days ;-) We are so into drinking homemade smoothies lately. It’s our drink of the summer. This wonderful strawberry smoothie was consumed a few days ago. (smile) Every time we have these I feel all refreshed. One day last week, I got all creative and decided to make us a special one for dessert and I was really wanting chocolate. But we didn’t have any chocolate syrup around here. We did have something that was supposed to be chocolate, but it tasted more like caramel. We had tried it on ice cream, but it didn’t really work well. So it got shelved. Then when I was craving some chocolate to put in our drink, I thought of this strange chocolate/caramel hybrid syrup. So it’s been a smoothie summer around here. It may have to be a smoothie fall/autumn too…and winter… and spring…LOL. This past Wednesday, Brit Boy and I went on a day trip to London. It was great to get a day out. 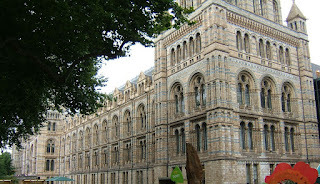 We took the train into Paddington Station and then took the tube/subway to the South Kensington Station and arrived to see long queues to get into the Natural History Museum. We thought for a minute that we should maybe give it a pass and just go somewhere else, but then we decided to try for a minute and see how fast things were moving. In the end, it didn’t take much time at all. We got in the shorter of the two queues so it worked out well :-) The museum itself is beautiful to look at. The architecture is extraordinary inside and outside. Here’s a quick photo of the outside that I took as we shuffled along to get inside. Here are a few photos from inside too. 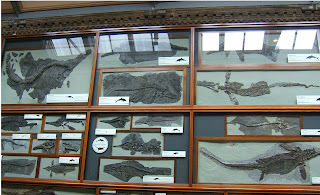 This is a photo of one of the numerous display cases inside. The collection was really impressive. 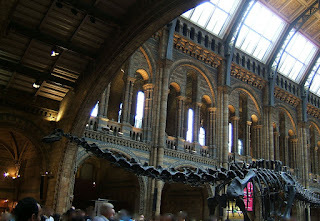 Here’s a photo of one of the dinosaurs on display in the main area. It was massive. 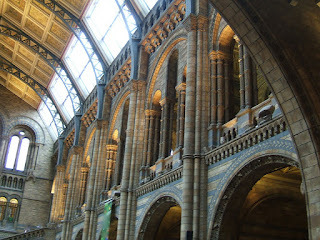 And here’s a view of the beautiful inside architecture of the museum. The many arches reminded me of the inside of a church. It was lovely. 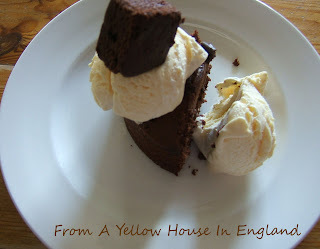 We had a nice weekend around the Yellow House. The weather turned out okay too. Brit Boy has been on vacation this past week and he's off this week too, so we've been doing lots of hanging out. We're planning on taking a trip into London on Wednesday so we're looking forward to that. On Saturday we had sunny weather and it brought the butterflies out. Here's a short video I filmed with my handy little retro mini cam. So this is the second in my mini cam moments series :-) We have a white and purple butterfly bush or buddleia as it's sometimes called, in our yard/garden and over the last few sunny days, we've been visited by various colorful butterflies. I looked it up and it seems that this is a peacock butterfly, but I'm not absolutely sure. It looks similar though. I'm hoping to get some better video on another sunny day. Butterflies don't hang about so it's hard to catch a good glimpse :-) Anyway, I wanted to share this mini cam moment with you all to let you see a bit of our summer. I did this video from inside whilst looking outside since I didn't have time to make it outside. The clanging sounds in the background are Brit Boy in the kitchen :-) I hope you enjoy this and I hope to get more when the sun shines and the butterflies return again. Have a great day! I got this meme from Heidi at Health Nut Wannabee Mom. I did it on Facebook a couple of days ago, but I'm posting it here with more info and a couple of updates I just made to it. Life is ever changing :) I thought this was a great opportunity to let you all know more about me. I don't know how interesting I am, but I hope you enjoy reading my list :) Please take this meme if you like...it's fun. At 8:30 am... although I usually get up at 6:30am with Brit Boy, but he's on vacation this week, so I've been sleeping a bit longer. 19. Who do you think will not try this meme? 20. Person you expect will try this meme first? I said more of a night person before, but then I had more of a think on it. I'm a bit of both I guess, but then this goes back to the 11 o'clock thing. I get really energetic around 11am and I'm good for quite a while. Then I get really energetic around 11pm for a couple of hours. LOL.It's like clockwork and it never fails. There must be some numerology going on here. So from eleven til twelve I'm wide awake...so call on me then and you'll get 100% of my attention. LOL. 25. Any new and exciting news you'd like to share? Not sure ????? We had cats and dogs when I was growing up, so I guess I like both. Yes and I got hurt...a van hit the passenger side and I got bumped into hard and had trouble walking for a while. I'm fine now. 37. How many times did you fail your driver's test? 42. Do you like broccoli? 48. How many are you tagging for this meme? 49. What time did you finish this meme? 50. Are you a coffee drinker? Last Tuesday I went along with Brit Boy for an appointment he had in Salisbury. I’ve been meaning to share a bit about it, but I’ve been doing school work for the last few days and am now just getting caught up. A few days before, I was looking around some stored things and found my mini video camera that I’ve had for years and never use anymore. The camera is very tiny and old school and makes funny little pixelated, jumpy movies. (smile) It gives the movies a zany quality that I like. We have a new video camera, but now that I’ve found this one again, I’m going to use it and make my funny little movies. (smile) So here’s my first video in my series. I’m calling my series “My Mini Cam Moments”. I’ll be doing them periodically and sharing them here. This video is a test of sorts that I did to see if it’s still working. This is a short video of us driving into Salisbury with a view of lovely Salisbury Cathedral in the distance with a few groups of trees along the way. (laugh) Enjoy! 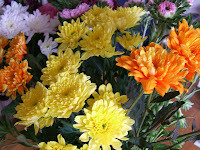 Also, I took a couple of photos of the flowers on display along the way here and there. The first one was taken along the road in Salisbury where I recorded the video. Well, that’s all for now. We won’t be going to Salisbury this week, but if we go anywhere good, I’ll certainly share it here. Happy August!